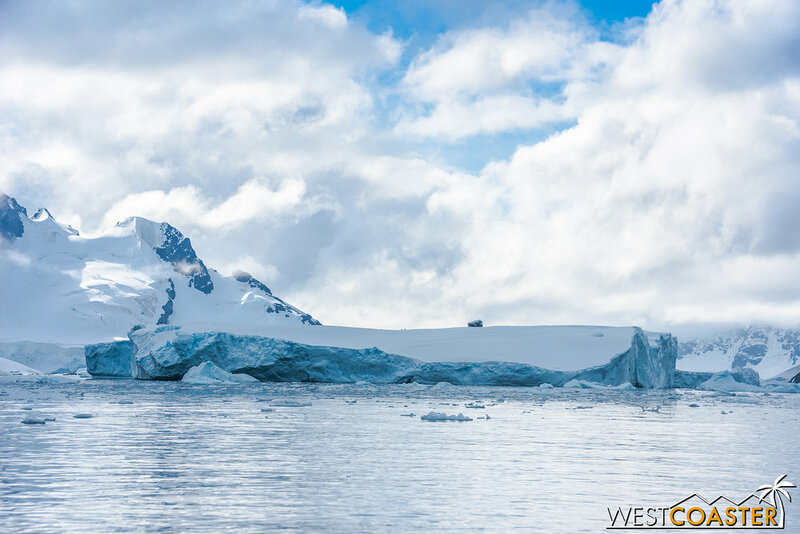 It's time another edition of my series of Antarctica trip reports from my trip to the southern-most continent in the world last month! Today, we pick up almost right after our last stop at Danco Island and take a look at our first continental landing of the trip! Thusfar, we had made excursions to islands just off Antarctica proper--Deception Island and Danco Island as mentioned. Although considered to be part of the continent geographically, sticklers about landmass might not quite completely count the prior stops as continental credits, because they weren't on the mainland. That would change after lunch, when we arrived at Paradise Harbor. 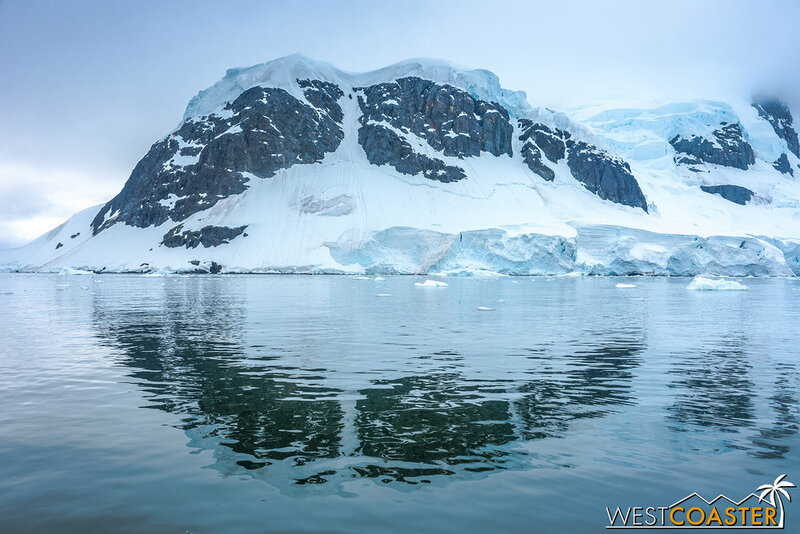 As beautiful, blue skied, and sunny as it was in the morning when we explored Danco Island, the weather quickly changed as we made the dozen or so nautical mile cruise down the Antarctic peninsula over to Paradise Harbor (or Bay, as some call it). By the time we neared our destination, the ambiance had turned cloudy. It was just a hint at how quickly weather could change in this untamed land, though fortunately, we would be spared any inconveniencing inclement weather throughout our cruise. A glimpse at a glacier rippling into the water of Paradise Harbor. Our first proper continental landing would take place at Base Almirante Brown, an Argentinian scientific research base established in 1951 and now occupied during the summers. This was a momentous occasion, because for many passengers on board the Ocean Diamond, this would officially mark their 7th continent visited. My friend and cabinmate, Veronica, would be among them, and there was a palpable excitement in the air as we put on our waterproof gear, inflatable life vest, and dry packs to lug our gear. A look at Base Brown, our afternoon excursion. The rocky landing, with our expedition guides ready to assist disembarking. Because it was the afternoon, our group was among the two who would head to land first before taking a Zodiac cruise during the second half of our excursion. As we pushed off from the Ocean Diamond's floating dock and began motoring toward the station, we were forewarned of the rocky beach landing we would be encountering--a different and more challenging manner of stepping foot onto dry land than the relatively easy sandy beach landings of our first two ventures. Fortunately, with low wind and no precipitation or other weather challenges, we were able to smoothly disembark and take our first official steps on the Antarctic continent! Our first continental landing, officially marking the 7th continent for many passengers! Stairs leading up from the rocky coast led us through a cluster of buildings that formed Base Brown. 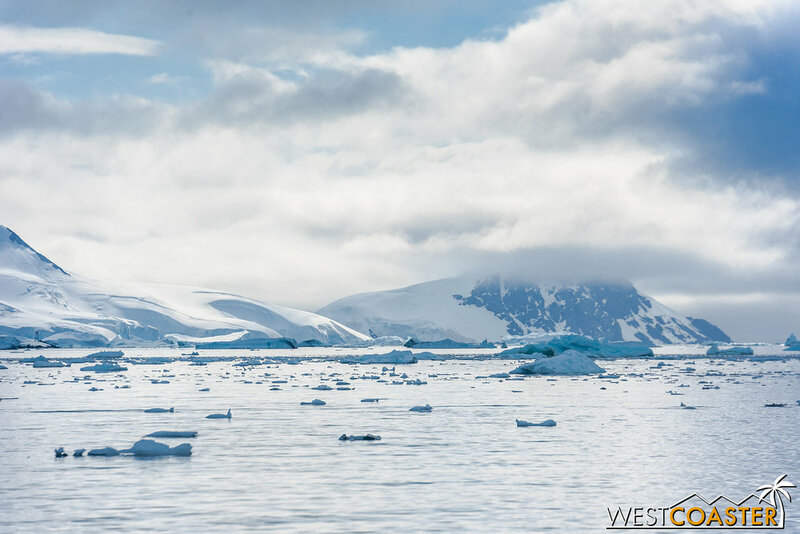 Here, scientists work on research related to biology, biochemistry, geology, oceanography, seismology, ozone monitoring, and other environmental observations to help further understand what life is like in the Antarctic wild and how environmental changes are being impacted and impacting the nature. The buildings at Base Brown have certainly see their fair share of the elements. Unsurprisingly, we found a gentoo penguin colony waiting for us on the rocks. The odor of their guano was more than conspicuous. The base itself was just a simple set of wood framed, metal clad buildings, but time and weathering had certainly shown their effects. Peeled and bubbled paint created pock marks on the building walls, and dents on the metal siding bore witness to the power of winds in this region. But Mother Nature could not succeed in wiping the base off of her land. We could spot a couple of scientists through their windows as we passed, working in their offices. A gentoo penguin waddling around. An overview of the base. Rusted steel and peeled paint compose a rugged texture. As with Danco Island, we had one path toward a high point overlooking Base Brown and Paradise Harbor. Just as in the morning, we took a hiking pole and began our trek uphill. The climb was similar in length and height to the morning, though the chillier afternoon air (still quite mild by Antarctica standards) made it seem a wee bit more challenging. Adding to the mood, at one point, our line of adventurers heard a thunderous crack in the distance--the unmistakable sound of ice breaking off a larger mass and calving into the sea. But scan as we did across the harbor, we couldn't locate the source. Hiking uphill to a high point overlook. The trail, steep in certain parts! We reached the terminus of our hike within 20-30 minutes. The very top featured a tight clamber over rocks to reach a panorama point that only one person could access at a time. Just beyond was a rope marking the boundary of access, and just beyond that, a steep drop down sharp, jagged boulders to the icy waters of Paradise Harbor below. Overlooking Base Brown and Paradise Harbor from the top of the trail. The view to the water beyond. It's a steep drop down! An adventurer takes in the view beside on of our Quark Expedition guides. A view that's not for the acrophobic! Moss and lichen comprise the limited plantlife in Antarctica. Below that were two other names--either parents or two other souls lost to the shifting ice of Antarctica. It was a grim reminder to take nothing for granted when it came to exploration on "The 7th Continent." More penguins near the top of the hike. The way down was much quicker than the way up, especially with my tendency to intentionally slide and sort of "ski" through the snowy trail. I didn't know this at the time, but there was also a grooved valley down which tourists sometimes sled. We wouldn't have been allowed to do this on our visit, and our Quark expedition guides never mentioned the option (probably to dissuade people from trying this semi-hazardous endeavor), but it would have been fun to speed down to the base on a toboggan rather than on foot! Once back at the base, we waited for our Zodiacs to fetch us, so that we could take a nice ride through Paradise Harbor. 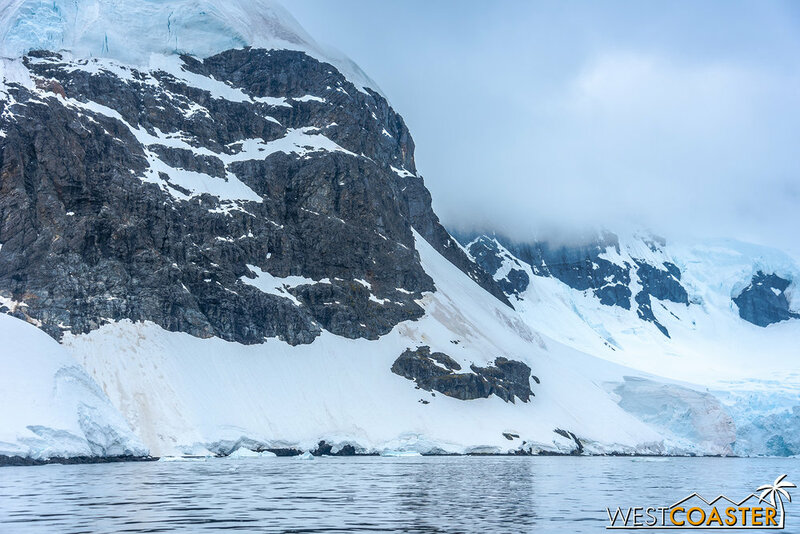 Whereas our Deception Island cruise the previous day (and to an extent, our Danco Island cruise earlier in the morning) had featured encounters with wildlife, the most astonishing aspect of our ride around Paradise Harbor was the resplendent icescape that surrounded us. Cormorants--adults and chicks--perched on rocks high above the water. Granted, we did have some wildlife encounters. 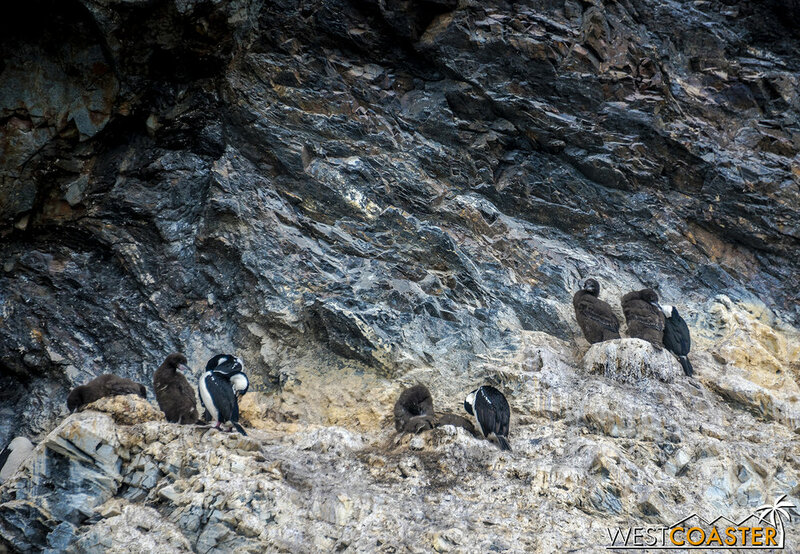 There were nesting Antarctic cormorant adults and chicks on the towering cliffs above us as we passed by the rocky coastline. The chicks were fluffy with their brown coats not yet molted. The birds seemed completely at ease at their steep perch, and it was impressive to see the whole congregation of them all along the stony, precipitous face. 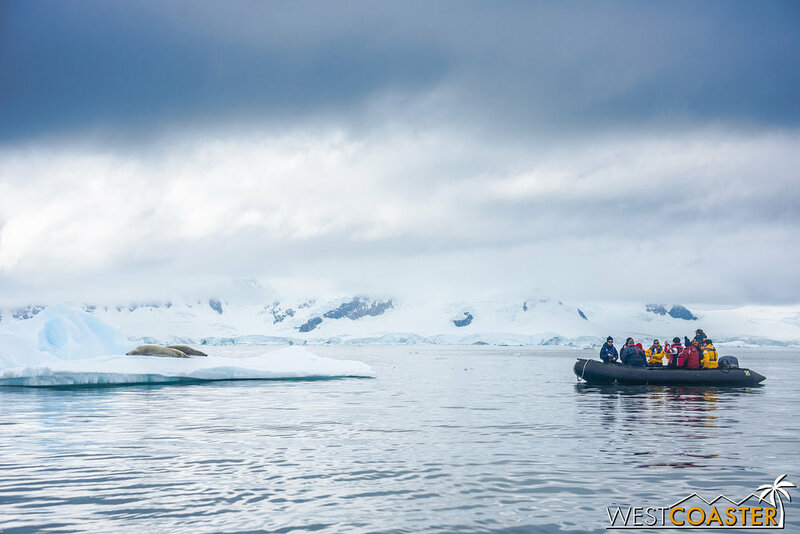 We also spotted a couple of sleeping crabeater seals, which certainly had the raft excited and aflutter with shutter clicks from everyone's cameras. A pair of crabeater seals sleeping on the ice. By and large, though, the story of the afternoon was the incredible glaciers and ice-capped mountains that surrounded us. The weather might have been cloudy, and we might have been missing the golden hues of sunshine, but that did not dampen our amazement at what lay around us. What seems to be a wave of ice cresting over the mountains and rocks. 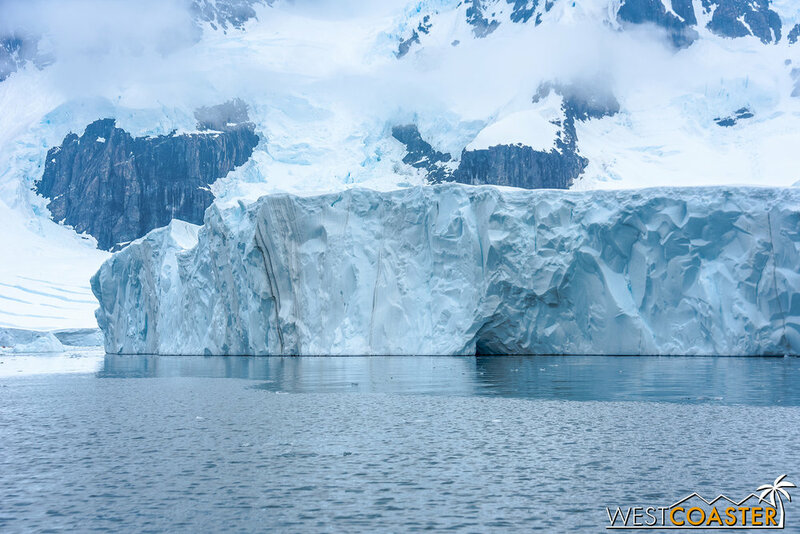 At one point in the cruise, we neared a point along the coast were a great glacier folded into the seawater. It was incredible to see such massive sheets of compressed snow fracture and slide into the water. Even more wondrously, there appeared to be an ice cave at the face of a section of the glacial edge. However, our expedition guide provided a good reason to keep our distance away from the towering wall of ice. It turns out that the rumbling crack we had heard earlier was indeed glacial ice breaking off and falling into the water. 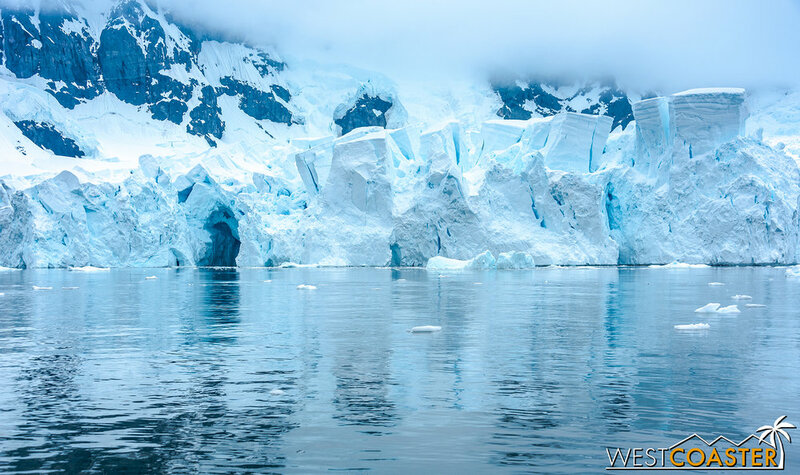 However, rather than tumble from above, the break had happened beneath the surface, and the resulting rogue iceberg and then shot up out of the water like a breaching whale. This "shooter iceberg" had erupted out of the water seemingly out of nowhere. The rare event sounded incredible for those of us on heading up the peak from Base Brown. It must have been even more incredible to witness in person for those who had been cruising near enough during the first half of the excursion! The icescape around the harbor is majestic. 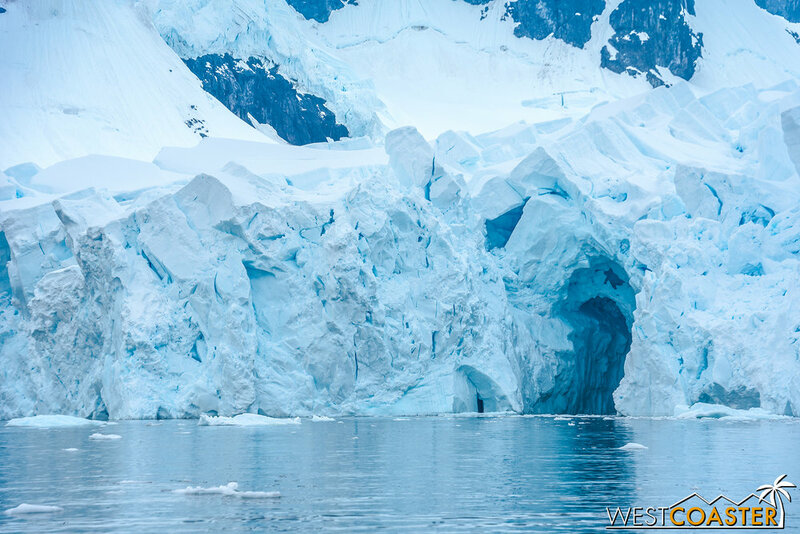 What looks like an ice cave is actually the edge of the glacier, and where the "shooter iceberg" erupted earlier. The texture of the ice coming apart is ethereal. We alternated between cruising around the bay and pausing and just drifting, taking in the silence and the stillness of the water and the scenery. With the clouds descending down the mountains, the vista that lay in front of us was truly fantastic and fantastical. It almost seemed like setting of some mystical epic. 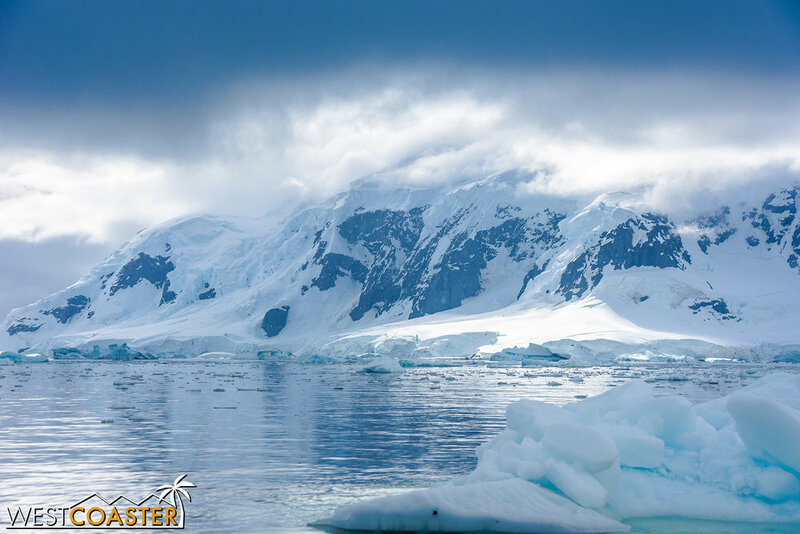 Such icy mountains meeting frigid seas was nothing something one encountered everyday! Cloudy skies and bits of sea ice to the northeast. Quite a tranquil scene, despite the gloominess. Soon enough, though, it was time to return to the ship. Naturally, the sun chose this time to finally start peeking out from behind the clouds again, at least toward the west. 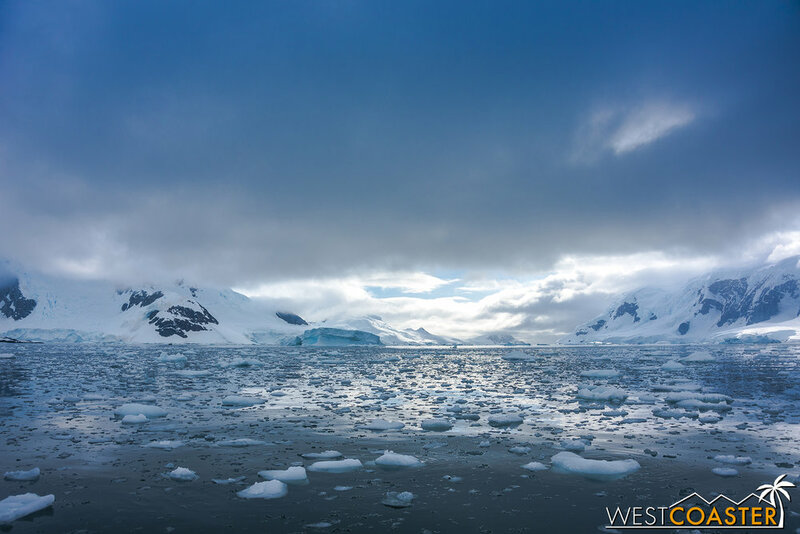 The cloudiness of the east created a surreal dichotomy, offering a taste of sunny and bleak Antarctica at the same time. I took as many shots of a sun-dripped continent as I could, but I was limited by the time it took to cruise back to the Ocean Diamond to return to our cabins. But clearing skies and peeking sun to the west! 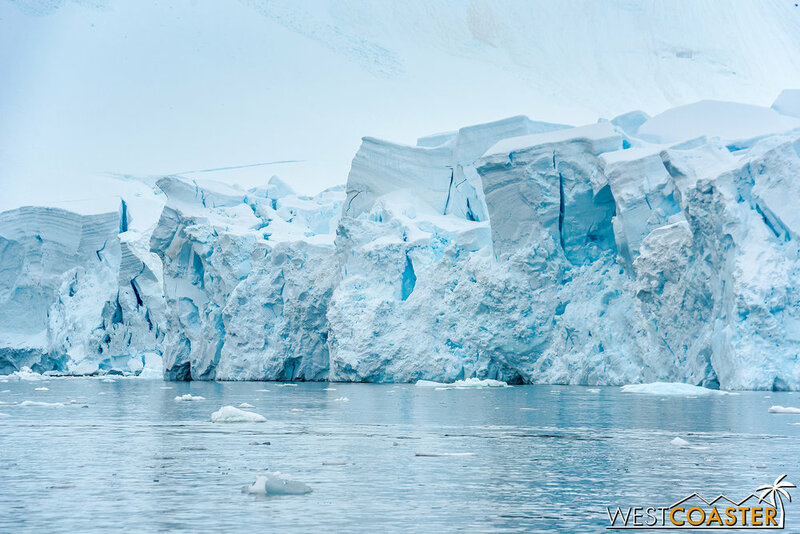 A uniquely shaped iceberg floats by on its long path to becoming one with the sea. But this would not be the end of our adventures for the day, even though we had completed our requisite pair of visits. 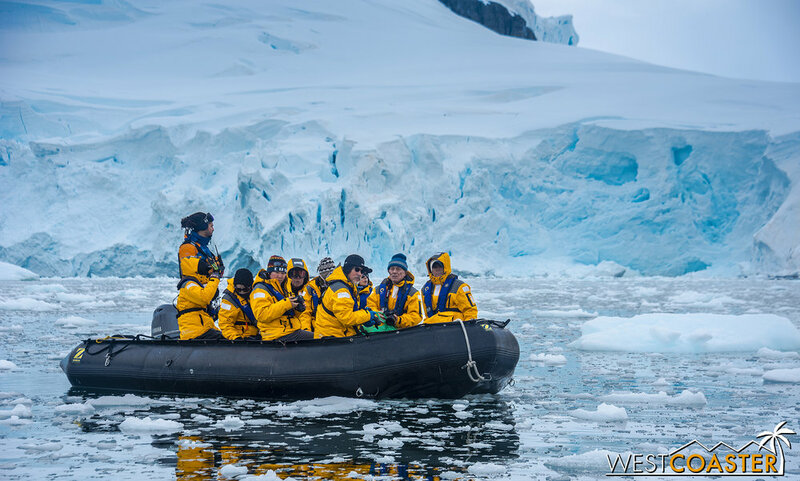 For my friends had I had been among a group of 60 guests crazy enough to sign up for overnight camping on Antarctic land--exposed to the elements--and not back out after being briefed on all that would entail. We would be motoring off to do just that after dinner! 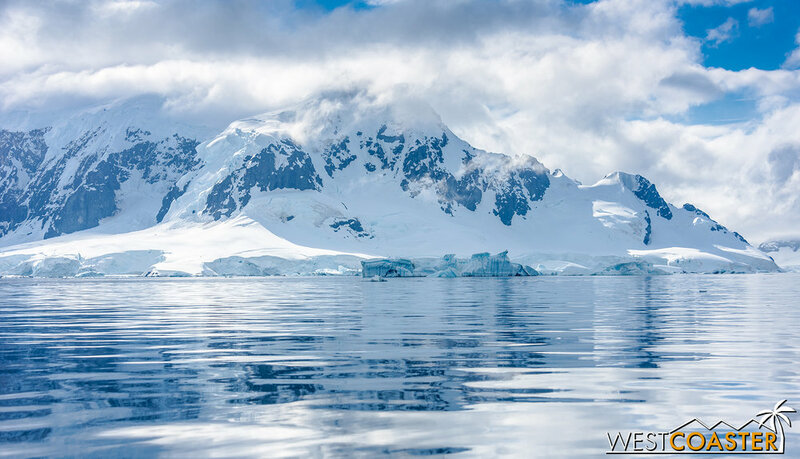 Camping in Antarctica--an ultimate bragging right. But details on that adventure will have to wait until the next chapter of this Antarctica trip report series!